Thanks to everyone who attended our Halloween/Bonfire event. It was a great night and thanks to all who helped and donated. 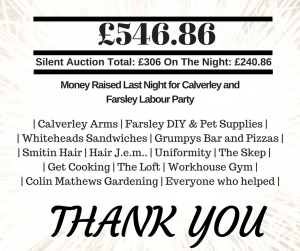 Through fantastic donations from local businesses and members, the silent auction alone raised £306, with a further £240 raised through stalls on the night! Once again many thanks to the businesses and members who donated. Posted on 29th October 2017 by Peter Carlill / Posted in Uncategorised.